What is the procedure for finding out which version of Internet Explorer is in use in my Dell notebook running windows? Please share some details for verifying it. You can easily find out which version of Internet Explorer is in use in your Dell notebook running windows. Follow the below steps for doing it. There you can see the version of Internet Explorer is in use in your Dell notebook running windows. 2. Add or Remove Programs. 4. Version will be listed near the name. Its very east to check the version of Internet explorer that you are using. Go to the menu bar & click on Help. Now a dialog box will appear containing all the information regarding the version of your internet explorer. Hope now you can find the version of your internet explorer. 1.Open an Internet Explorer browser window and go to "File." 3.Select "Export to file" and press "Next." 4.Select "Favorites" and any other information you want to export and press "Next." 5.Press "Next" again and choose a location to save your file. 6.Press "Export" to backup your settings. 7.Go to "Start" or press the Start globe. 9.Select "Uninstall a Program" under the "Programs" pane. For XP, select "Add/Remove Programs." 10.Choose "Turn Windows features on or off" in Windows 7. Uncheck the box beside Internet Explorer and press "Yes" when prompted. 11.Choose "View Installed Updates" in Windows Vista. Double click your version of Internet Explorer and press "Uninstall." Restart your computer. 12.Select your version of Internet Explorer from the installed programs list in Windows XP. Press "Remove." Follow the prompts to remove. Open the window, this window show the version of internet explorer used in the window.. 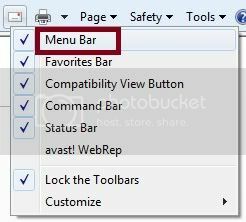 I hope this help you..
2.Go to help option which will be to the last of the menu bar. 3.Then click on help menu and then click on "About Internet Explorer". 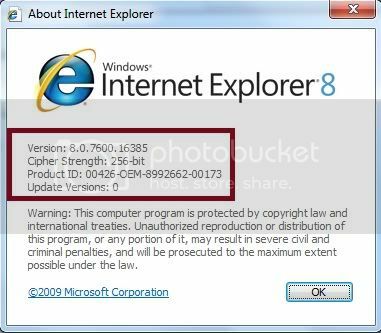 4.Then u can find the total description about the internet explorer k.
That will notify you the version of I.E in your system . 3)now a window appears and shows the details of your internet explorer.